Challenge students to explore the natural and physical world with this collection of science worksheets and activities. Don't see a worksheet you need? Use our Test Maker™ to create your own printable that fits your needs. Browse science questions or use our advanced search to find existing questions while filtering by grade levels and keywords. Customize your test further by creating your own assessment questions. Worksheets noted with (NGSS) support Next Generation Science Standards. Select the worksheet link to view the alignment note in the upper left corner of its page. Search for NGSS questions to see all content available. 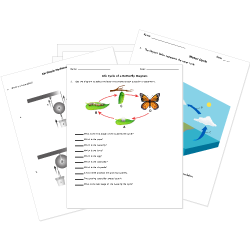 From what organisms need to survive to habitats and life cycles, use these life science worksheets and activities to supplement and support your life science teaching. Comparing Bird Feet Adaptations new! Comparing Bird Beak Adaptations new! From the early grades, students must develop an understanding of energy and matter and its interactions. Use these worksheets to support your physical science teaching and allow students to discover the roles of matter and energy in their worlds. Naming Pushing and Pulling Forces new! Clip Cards - Push or Pull? Pushes and Pulls Word Search new! Asking questions, modeling, and carrying out investigations are practices that all scientifically literate students must master. Introduce elementary students to these fundamental skills and methods with our scientific methods and scientific skills worksheets.